The Nurse’s week is the perfect time to thank a nurse for all she has done for you. It is a time when many friends and family members decide to scourge the internet for ideal gifts. Finding the ideal gift is hard. Finding the perfect gift for a nurse is almost impossible. Most nurses love gifts that bring a little laughter into their day. It adds a little cheer to their usually serious hours which they spend working in hospitals. Searching for these gifts requires a unique skill. Let’s take a look at five really unique gifts that you can give a nurse this Nurse’s week. This ceramic mug weighs only six ounces but packs a large amount of fun into the gift. In a unique orange and white design, the mug looks like a prescription bottle. It even has the words ‘Prescription Coffee’ written in bold letters on it! Can this mug get any better? The label tells you that the coffee is prescribed by Doctor Harold Feelgood. The prescription states that the nurse must drink one mug by mouth and repeat till she feels awake. To add the humor, the mug also states that the prescription expires when the mug is empty! A fridge magnet can make a small and thoughtful gift. This particular magnet is designed in a retro style. It has a nurse dressed in a really retro nurse’s uniform, who stares out at you while holding a syringe. The quote however is what makes the magnet a barrel of laughs. It says “Don’t Mess With Me, I Get Paid To Stab People With Sharp Objects”. This is a gift which is meant for a nurse with a sense of humor! Another really hilarious gift is the Drink with a nurse RN bottle opener key chain. This bottle opener comes with the words “Safety First, Drink With A Nurse’ engraved in it. It is guaranteed to give the recipient a number of laughs. The practicality of the gift is not lost either. Though the gift is a bottle opener, it also functions as a key chain. Combine this with a chilled bottle of wine and you may have just made yourself a friend for life! Like the previous magnet, this magnet is also modeled around the retro theme. It has a picture of a nurse who is talking on the telephone. The quote reads as follows, “Sorry, Can’t cure Stupid”. The nurse in the picture has a very wide smile on her face. We can only wonder what is going on in her mind. Is she telling the person on the phone that she can’t cure stupid or did she tell it to the person who just walked up in front of her? Whatever it may be, this particular piece makes an excellent gift for close friends and colleagues. Though it is a fridge magnet, the nurse may choose to use it on her locker. After all, there is no better way to make everyone’s day, than by making them laugh for a while. There has never been a nurse that does not like either coffee or tea. These caffeinated drinks are the lifeline of nurses everywhere. It is the one thing that keeps them going through the long hours that they work. That is what makes this gift exceptionally good. Not only is the mug light but it can be used for either coffee or tea. By now, the word ‘gag’ must have caught your attention. Yes! This gift is also designed to make the recipient laugh. Don’t let the simple black and white design fool you, for some very important facts are written on it’s chart. One for example says that the daily value for hard working is 1000 percent while that for unrivaled skill is 500 percent. It is perfect for any hardworking, caring and skilled nurse that you know! Nurses work long hours and through many nights. Many at times, their work goes unnoticed. The Nurse’s week is just one week in which we honor them for their sacrifices and their good deeds. Make a nurse laugh with the perfect gift. You will find that the laughter will never end! What Are Ligament Injuries and How Should You Treat Them? 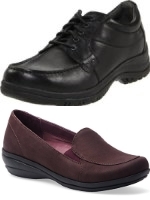 ComfortingFootwear.com is a participant in the Amazon Associates Program, an affiliate advertising program designed to provide a means for sites to earn advertising fees by advertising and linking to Amazon.com. ComfortingFootwear.com also participates in various other affiliate programs, and we sometimes get a commission for purchases made through our links.